The neckband design is sleek and comfortable and sound quality is surprisingly clear despite the favoring of bass frequencies and lack of high-quality codec support. Fit proves to be an issue due to the ear tip material and battery life falls short of the ambitious 18 hours claimed by Huawei. However, if you were disappointed by the FreeBuds from last year, the FreeLace offer a bit more promise. The Huawei FreeLace leans on its novel neckband design that sheathes a USB-C plug for on-the-go charging via a compatible smartphone. Battery life and connectivity are better than its true wireless sibling, but is that enough to make the FreeLace worth your hard-earned dollar? Editor’s note: this review was updated on April 25, 2019, to address AAC compatibility. Who is the Huawei FreeLace for? The Huawei FreeLace earbuds work best with Huawei phones running EMUI 9.1 or later. Just as the new AirPods are made for Apple users first, everyone else second, the Huawei FreeLace is for Huawei smartphone users. In order to take full advantage of the FreeLace’s HiPair technology—which automatically pairs the earbuds to your smartphone upon USB-C connection—your phone must support EMUI 9.1 or later. Of course, anyone may use the FreeLace, and the lightweight design alongside the solid microphone and sound quality make these ‘buds an appealing option for all. What’s it like to use the Huawei FreeLace? In order to access your respective virtual assistant, hold the multifunction button for a few seconds. Save for the integrated USB-C plug, it’s just like using any pair of neckband earbuds. Let’s start with the novel: Huawei’s HiPair technology is neat. Being able to plug-and-pair your headset is convenient—though, not much more than NFC pairing—but the real benefit comes with being able to charge the FreeLace from your phone. Unlike with HiPair, you don’t need a Huawei phone to do this. 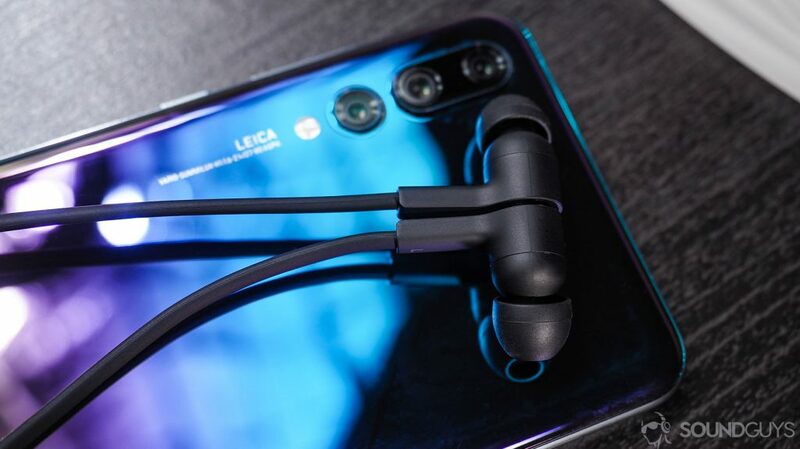 Other than HiPair, which automatically pairs the Huawei FreeLace to a Huawei phone upon a USB-C connection, the FreeLace is similar to any other pair of neckband earbuds. The right side of the neckband detaches from the earbud cable to reveal a USB-C plug; this section is marked by an encompassing red line. Detaching the parts requires just enough force that I wasn’t concerned about accidental separation. Just north of the painted red line is the three-button mic and remote module, whereby the volume rockers are slightly elevated above the multifunction button. This makes it easy to operate despite the slick metal exterior. If you’re familiar with the BeatsX, then you’ll feel at home with the FreeLace memory cable connecting the earbuds. It’s non-slip material is comfortable and lightweight. However, for my neck, the nodes are a bit long and overlap one another. The metal neckband end caps are a nice touch to accent the rubberized, flexible collar. More and more earbuds are taking on an ergonomic design by sporting angled nozzles, and the FreeLace has followed suit. That said, the earbuds don’t stay in well because the silicone ear tips are ridiculously slippery. I imagine catching salmon with your bare hands would be easier than keeping these in place while moving. Swapping out the medium ear tips for the large ones helped, but the earbuds still fell from my ears as I walked from my apartment to my car. On a positive note, the magnetic housings work flawlessly to automatically play and resume music when separated and brought together. Although the integrated microphone quiets most vocal registers, it does so evenly and transmits a pleasantly clear sound for a headset mic. Microphone quality is excellent. The mic’s noise cancelling technology attenuates background noise, including low-speed winds. This is, however, counteracted by how the microphone frequently rubs against clothing, resulting in a distracting whoosh that’s transmitted to whoever is on the other end of your call. For what it’s worth, I did hold a few quick calls while keeping my head fairly still and it worked well; though, I did feel rather silly. Our testing yielded a 12.25-hour battery life, which is significantly shorter than Huawei’s claimed 18-hour playback time. That said, our testing standards require any headset to play a constant output of 75dB(SPL), which is likely louder than what’s required by various company standards. Additionally, 12 consecutive hours is longer than most of us do or would choose to listen to music, so it’s still fine for real-world use. Plus, the earbuds’ 120mAh battery supports quick charging. A mere five minutes allows four hours of playback. How do I connect the FreeLace to my phone? As long as your phone has a USB-C port, you can charge the Huawei FreeLace. If you have a Huawei phone with EMUI 9.1 or later, you may plug the FreeLace directly into your phone’s USB-C input. However, if you’re like me and use a Samsung S10e or other Android device, you’re left to traditional Bluetooth pairing. The process is fine. However, I was disappointed to learn the FreeLace doesn’t support multiconnect. This means you can only connect to one device at a time. Thankfully, the earbuds use Bluetooth 5 and stay connected without stutters or drops. I even went as far as to leave my phone by the front door as I sat on my balcony, and the earbuds stayed connected. For reference, this is about a 15-meter distance through one wall and one glass window. Although high-quality Bluetooth codecs aren’t supported, the reliable connectivity takes precedence for many, myself included, during regular use. The earbuds support both the AAC and SBC high-quality codecs; however, with our preproduction unit streaming from a Galaxy S10e, playback automatically reverted back to SBC even upon attempting to force the AAC codec. The Huawei FreeLace earbuds have a neutral-leaning sound signature while retaining the emphasized low-end many consumers enjoy. Passive isolation is ineffective with these earbuds; however, third-part memory foam ear tips may help. The Huawei FreeLace earbuds house 9.2mm dynamic drivers which produce a fairly neutral sound, albeit not as neutral-leaning as the Samsung Galaxy Buds. As illustrated in the chart above, the bass response (pink) is slightly emphasized compared to the mids (green), which results in minimal auditory masking, but only in predominantly bass-heavy songs. Isolation is another story, though. The earbuds are hardly able to mitigate external noise. If you’re surrounded by loud noises, this may lessen audio quality and compel you to increase the volume. While it’s tempting to do so, it may place you at risk for noise-induced hearing loss. In which case, you’re better off looking into memory foam ear tips. The magnetized earbuds keep the Huawei FreeLace tidy when not in use and automatically play and pause music. In Arcade Fire’s song Keep the Car Running, multiple instruments of varying frequencies are simultaneously played throughout the song’s entirety. This means it’s a challenging song for headphones to get right as there’s little margin for error without turning things into an indistinguishable, masked mess. Due to the Huawei FreeLace’s relatively even-keel frequency response, the song is reproduced clearly with an identifiable distinction between instruments. One of the most difficult parts of the song for headphones to reproduce can be heard at 1:56, the beginning of the second chorus. Win Butler’s strained vocals are belted out amid a collection of guitars, claps, piano chords, and tambourine and drum hits. I was skeptical of how these ~$100 earbuds would handle such a difficult instrumental medley, but the chorus is relayed clearly. The most notable masking occurs between the bass guitar and electric guitars. Unfortunately, some clarity is lost from the latter due to the former, but it’s a small price to pay for what’s otherwise skillfully handled. Should you buy the Huawei FreeLace? The Huawei FreeLace is set to retail for 99 euros, roughly $111, and to use HiPair, you need a Huawei phone. If you’re a Huawei smartphone owner, the Huawei FreeLace makes sense. After all, you might as well invest fully into a brand and it’s hardware to streamline your daily usage. That said, if you’re an iPhone or Android owner, then the FreeLace makes less sense to buy over something like the BeatsX or Plantronics BackBeat Go 410. The former works flawlessly with Apple devices as it includes the W1 chip, which was only recently outdone by the company’s H1 chip, and the latter features excellent noise cancelling for the price and optional wired listening.